If you have decided to acquire a karaoke system, you might experience some difficulty selecting among the multitude of brands of karaoke systems one can find nowadays. 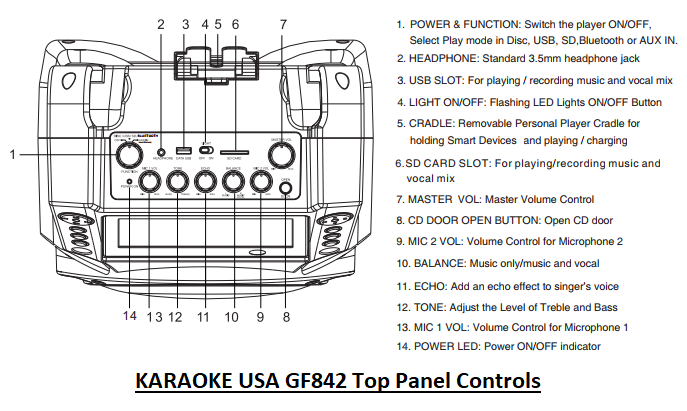 To facilitate the task, we will be presenting in this article two of the most popular karaoke systems bought by Amazon customers, namely the SINGTRIX STGX1 and the KARAOKE USA GF842. Note that both karaoke systems can be connected to your smartphone, tablet or other intelligent device you may own, so that you may be able to download all kinds of music and songs from your own music library, from YouTube, and other sources. However, these two karaoke systems are quite different in appearance, structure and features. ​In this article, we will describe the features and characteristics of both systems so that you may be able to choose the one that will best match your own music making and singing requirements. 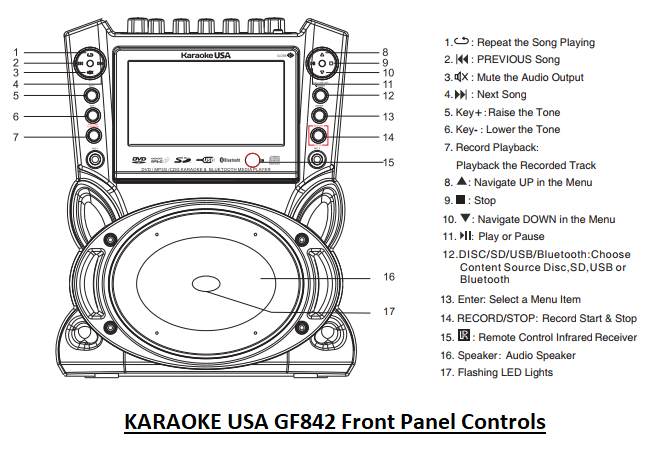 This article will compare the SINGTRIX STGX1 and KARAOKE USA GF842 Karaoke systems. These two systems were the most popular among Amazon customers at the time this article was written, and had each received an average rating of 4 stars from Amazon customers. Selected Karaoke Systems on Amazon. Otherwise, please continue with the product comparison below. Singtrix STGX1 has three major components: the Singtrix Studio Effects Console, the Singtrix Microphone and the Singtrix Speaker. All three components are specifically tuned and designed to provide studio quality sound and singing experience that is exciting and fun. The Singtrix Studio Effects Console is the heart of the system and features a professional-grade vocal transformer with pitch correction, harmonization, and studio-quality reverbs & delays. In order to play some music, you simply connect a device such as a smartphone, tablet, computer, even guitar or keyboard to the 3.5mm input of the Studio Effects Console, and then start playing the music of your choice from that device. The lyrics are not displayed on the console's screen, but you can use your device (smartphone, tablet, etc.) to view the lyrics. The console screen is not made to view videos or lyrics, but is used to view only information that applies exclusively to the console's operation. ​You can choose your music input from your own song library, from YouTube and Karaoke Lyrics Tracks, or simply from the Singtrix app that can be easily downloaded to your device (the app exists for both iOS and Android devices). Note that the Singtrix app allows you to stream karaoke tracks from a large library that contains thousands of tracks. Powerful Processor: The processor works in real-time by analyzing the incoming music and generating key information that is applied to the singer's voice. It allows for polished "plug & play" results for all skill levels from beginner to pro. Over 300 Effect Presets: Singtrix has over 300 vocal effects to help you sound your best. These are vocal effects that are designed to cover music of any generation and of any genre (such as hip hop). On Demand Harmony: With the press of a button, it instantly creates a four-person vocal harmony that is adapted to your voice. Hit Effect: With the press of a button, you can take easily your chorus to the next level with on-demand harmonies and amped up effects. Song Voice: With the press of a button, it suppresses voice frequency in the music output so that it doesn't overpower your voice. Skill Level: With the press of a button, it enhances it enhances the quality of the voice making it sound better. Two Microphone Inputs: Allows for two people singing together (note that mic 1 becomes the lead mic when both inputs are used). Portable Big-Sound 2.1 Stereo Speaker: The custom designed big-sound 40-watt PA has a portable design. It has a built-in subwoofer which allows you to take the system wherever you go. Note that it can also be used as a home theater and gaming speaker. It has adjustments for volume, treble and bass to help you shape the sound for your room or venue. ​Singtrix uses studio quality vocal effects designed to make "bad singers sound good and good singers sound amazing!" It is supposed to be the same live vocal technology that professional music makers and singers use to sound great. Effects that the system is capable of include natural pitch-correction, powerful harmonies, hard tune, reverb, delay and more. It also features 3 skill levels plus voice cancellation that lowers vocals on standard music. It can be used for a multitude of applications such as karaoke parties, song composition, studio recordings, live band performance, public address, and church singing. ​Singtrix can also help develop and improve your voice naturally. As a vocal training tool, the unique natural pitch-correcting tuning effects act like training wheels for your voice and can help improve your singing. With Singtrix, you can sing in-tune to your favorite hits with confidence. Just plug into the headphone output of your mobile device and start singing. Singtrix will tune your voice to the music track and add studio quality effects such as 4-part harmony or choir, reverb, delay and so much more. Music Input: Balanced 1/8” mini stereo jack (3.5mm) . Speaker Outputs 1 & 2: Balanced 1/8” mini stereo jack (3.5mm). Mic inputs 1 & 2: 1/4” / 6.35mm phono jack (Mic 1 becomes the lead Mic when both inputs used). USB Type-B Port: For preset uploads and firmware upgrades. - Studio Controller Input: 100-240 VAC, 50/60 Hz, 0.2 A.
Dimensions: L-7.25” x W-5.75” x H-2.25”. Frequency Response: 60 Hz -15KHz. Comes with attached mic cable. 1/4” phone connector plug (tip/sleeve/ring). Impedance: 600+/-3% ohms at 1KHz. Size: Mid/High: 2 x 3.00" / Subwoofer: 5.25". - Mid/High: 200 Hz to 20 kHz. - Subwoofer: 20 to 100 Hz. Signal Inputs: Left & Right RCA connectors. - Speaker System Input: 100-240 VAC, 50/60 Hz, 1.2 A. - Speaker System Output: 18 VDC, 2800 mA. Weight: 11 lbs / Dimensions: L-12” x W-13” x H-11”. Custom Mic with "HIT" Effect Control. Pro-quality Mic Stand with Boom Arm and Device Holder for Tablets, Phones and MP3 Players. Faceplate Inserts - orange, black, blue and pink. - It is equipped with a beautiful 7" TFT digital color screen that is easy to read from far away. It can be used to display both lyrics and video. - It allows you to sing and record music and your voice onto an SD Card from your favorite karaoke disc. And you can instantly play back your recordings. ​It is both USB flash and SD card compatible. - It comes with 300 MP3G songs on two discs, but will also play any normal karaoke CDG, DVD Karaoke, and can also be used to watch a DVD movie. Note: MP3G is an MP3 audio file with an accompanying Graphics (lyrics) file. The screen has the capability to show the lyrics of the songs. But you must use MP3G files to see the lyrics, if you only use a regular CD there will be no words displayed on the screen. - It accepts auxiliary input from all sorts of personal devices such as smartphones, tablets, pads, MP3 players and more. It has both audio and video inputs/outputs. Therefore, it can be connected to big screen TV, or better, to your home entertainment center for great sound. The cables for connecting the various devices to the unit are provided. - It supports Bluetooth wireless connectivity of your device to the unit. Note that while GF842 supports Bluetooth, other models such as the GF839 and GF829S do not. - It is equipped with a 35W digital power amplifier and is PA system capable. - It can produce flashing LED lights that synchronize with the rhythm of the music. ​It is equipped with on/off switches for the sync lights. - It comes with a handy cradle to rest your MP3 player in, for charging or watching your screen in an upright position. - It comes with 2 microphones and is equipped with 2 microphone inputs as well as a remote-control device. - It has a built-in USB charger for smart devices. Echo Control: Adds an echo effect to singers voice. Balance Control: Allows balance control for music only or for music and voice. Key Control: Raises or lowers the key in which the music/song is played. Tone Control: Adjusts the level of treble and bass. - It measures 13 x 10 x 17.8 inches and weighs about 10 lbs. It's light and portable anywhere as long as you have an electrical outlet to connect it to. Remote-control device ("AAA" x 2 batteries not included). 300 MP3G Songs on 2 Discs. Universal Cradle for Storing Media Devices. RCA Audio/Video to RCA Audio/Video Cable. AC Adaptor: 110V/50Hz~AC 240V/60Hz (UL Approved). ​So, which of the two Karaoke Systems is best for you? Singtrix STGX1 improves your singing and make you sound like a pro! It features a professional-grade vocal transformer with pitch correction, harmonization, and studio-quality reverbs & delays. The powerful processor responsible for all this works in real-time by analyzing the incoming music and generating key information that is applied to the singer's voice in order to improve it. This feature is not available on KARAOKE USA GF842. In summary, we can say that Singtrix STGX1 is primarily a voice enhancement machine capable of adding some very interesting effects to your singing, but without some of the standard features that traditional karaoke machines would have, such as the ability to record and play CDs, or Bluetooth support for wireless connectivity to your smartphone, tablet, etc. It supports Bluetooth, meaning that you can enjoy a wire-free musical experience when using your smartphone or other devices to transfer music and videos. It has a screen that can display lyrics and videos. It can produce flashing LED lights that synchronize with the rhythm of the music. It supports raising and lowering the key of the music and songs. It supports recording and replay of the songs you sing. It comes with two mics, while Singtrix presently includes a single mic to the purchase. A second mic for Singtrix STGX1 can be optionally purchased (see Amazon section below). In summary, if you are looking for an excellent karaoke system that will automatically enhance your singing and give you the capability of adding all sorts of studio quality interesting effects, but which does not come with all the bells and whistles that traditional karaoke machines come with, then go for the Singtrix STGX1. On the other hand, if automatic improvement of the singing quality is not critical for you, but you'd rather have a machine that can display video and lyrics, can record, can play CDs, supports Bluetooth, and that gives you manual control of the singing quality by allowing you to change the key, the tone and by introducing special effects like echo, then go for the KARAOKE USA GF842. The extra cost of the Singtrix system is mainly due to the special processor that is capable of enhancing automatically your singing and that allows the addition of all those studio quality vocal effects.